Reports of the PC’s demise have been greatly exaggerated. We’ve all heard that everyone’s just buying tablets and throwing out their keyboards and mice. But, if you live in the real world, you see people using PCs every day. The statistics show that PCs are still selling in large numbers and are used much more than tablets. But we don’t need statistics to see this — we all know that huge amounts of people still use and need PCs. PC sales are declining fast. Soon, no one will buy them anymore. Everyone’s just buying tablets, and tablet sales are skyrocketing! That’s the established wisdom, anyway. But is that what the statistics really say? Gartner reports that 82.6 million PCs were shipped in the fourth quarter of 2013. That’s a 6.9 percent drop from the fourth quarter of 2012 and the seventh quarter in a row of declining shipments. This sounds like bad news, but the decline in PC sales has actually been slowing. Gartner believes that PC sales have “bottomed out” — while PC sales are dropping, it’s hardly a market in free fall. But it’s not really the sales that are important — it’s what people are actually using. 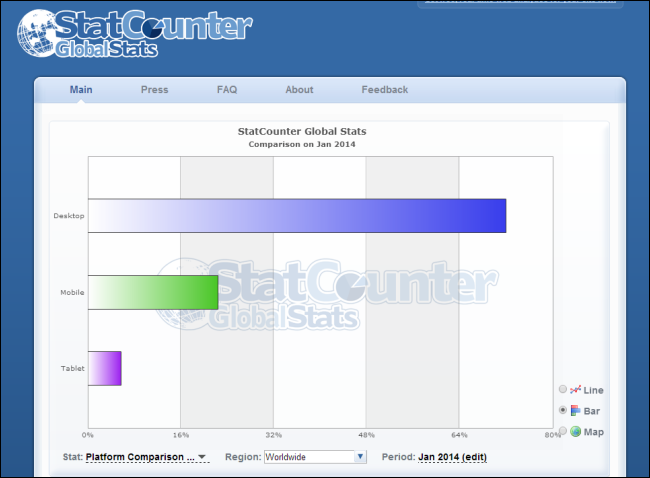 StatCounter’s browser usage data for January 2014 shows that desktop browsers accounted for 71.89% of visits, while mobile (smartphones) accounted for 22.42% and tablets accounted for just 5.69%. Most people are clearly using desktop web browsers to access the web. If they’re not, they’re probably using a smartphone browser — tablet browsers are far behind. But perhaps we’re just looking in reverse. What’s really important is the long-term trend. If tablet sales are accelerating, then tablets may just “kill” PCs. And, did you catch that? In spite of all the doom and gloom, more PCs than tablets were shipped worldwide in the fourth quarter of 2013. IDC used a word — “saturation” — that perfectly describes a big part of what’s going on. You don’t have to replace your computer as often as you used to. There was a time when each new version of Windows, Office, and even your web browser was heavier than ever. You saw a big speed improvement when you bought a new computer. You needed to keep buying new computers, because Windows Vista definitely wouldn’t run very well on that PC you bought when Windows XP came out. Today, Windows 7 and 8 run faster than Windows Vista on the same hardware. Even gaming PCs built years ago can likely still run the latest PC games at high settings. People just don’t have to replace their PCs as often, so of course PC sales are falling. PCs have reached a point where they’re “good enough.” People aren’t scrambling to upgrade their PCs every few years — they’re replacing them only when they need to. People have more PCs — laptops and even desktops — lying around than ever. On the other hand, tablets are still a new thing. Many people still don’t have tablets, so people are buying them more and more. If you want a new gadget and you’re perfectly happy with your laptop, of course you’re going to buy a tablet instead. And, like smartphones, tablets are improving faster than ever. Tablets from a few years ago have noticeably worse screens and slower hardware. They’re improving fast, just like PCs used to. You’ll see more of a benefit from upgrading an iPad that’s a few generations old than you will a laptop that’s a few generations old. Eventually, tablets will get to that “good enough” point where people won’t have to upgrade every few years, too. Tablet sales will slow and people will be saying “tablets are dying” because everyone is buying those new virtual reality headsets instead. Let’s analyze this data using some common sense. In the real world, multiple types of products can coexist for different people. First, tablets aren’t just a fad. In the past, everyone who wanted to browse the web, send some email, watch YouTube, do online banking, and play simple games needed an expensive PC that required regular maintenance. Now, if someone just wants an easy little device that lets them get online, they can get a tablet. Not everyone needs a PC, and even people who need PCs for some reason may want to use a tablet in their downtime instead. Second, PCs are still useful. They’re not an obsolete piece of technology. iPads, Android tablets, and even Windows 8 devices with their half-baked “Store apps” are no substitute for real PCs when it comes to doing many things. Whether you’re writing, coding, editing images, doing CAD work, doing other productive work — or even playing PC games — there’s a good chance you depend on a mouse and keyboard. You also depend on having a larger screen — maybe even multiple displays — and the ability to have more than one thing on screen at a time. But what is a PC, anyway? “PC” really just stands for “personal computer,” but it’s become synonymous with Windows, Linux, and even Mac OS X desktops and laptops. Really, smartphones are tablets are just as much personal computers as laptops and desktops are. They run software and are much faster than the PCs many of us grew up with. This isn’t just a hand-waving distinction. The lines are blurring. For example, is a Surface 2 tablet running Windows RT a PC? Maybe not — it’s just a tablet and can’t run typical Windows desktop applications! But what if you connected a keyboard, mouse, and connected it to an external display? What if you spent all your time using Office applications on the desktop on a large monitor? What about those new 8-inch Windows 8.1 tablets with an Intel chip and a full desktop — are they PCs? If they’re not because the screen is too small and they don’t have a keyboard, what if you connected a keyboard and an external display? Do they stop being PCs when you unplug your peripherals? It’s not all about Windows, either. 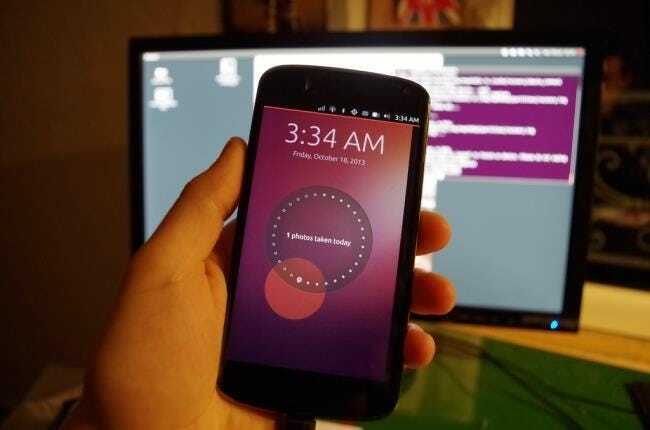 Would an Ubuntu Phone be a PC? Of course not, it’s a phone! But what if you plugged that Ubuntu phone into an HDMI port, connected a mouse and keyboard, and used the full Linux desktop on an external display? It’s clearly a PC now — but it’s running on a phone. 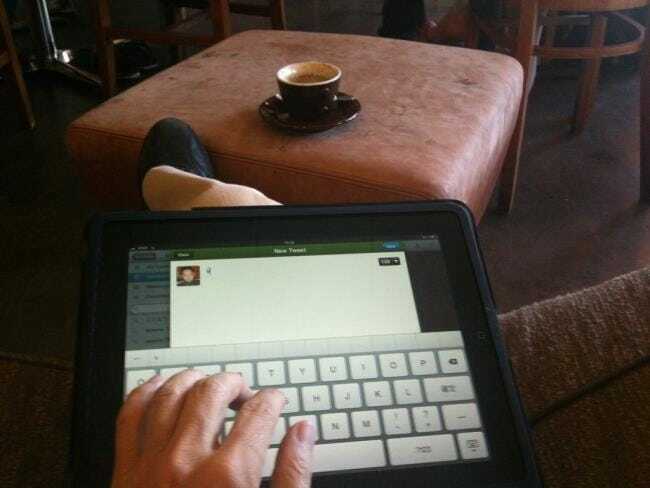 Tablets and PCs are growing closer to each other. Tablets are becoming more capable, and many PC laptops are becoming more mobile with better battery life.Microsoft is forcing tablets and PCs together — with mixed success — but Ubuntu is also working on creating a single operating system that can run on your phone and also be your desktop PC with the appropriate peripherals. In reality, there are more different types of hardware and software than ever. Not everyone is forced to use a beige tower running Windows. But PCs aren’t dying just because people have more choice. 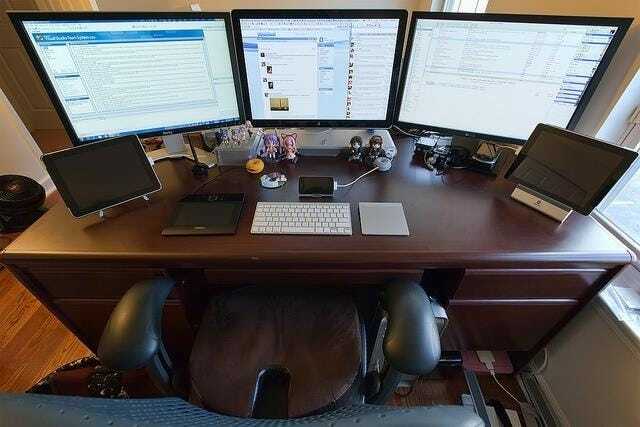 Some people will always need large screens, multiple windows, mice, keyboards, and all that other good stuff. Not everything will be done on a 10-inch or smaller touch screen. If we all end up running powerful software on Android, iOS, or another “mobile operating system” and using devices with large screens, multiple windows, keyboards, and mice — well, then we’re just using a different type of PC. PCs are more than Windows and desktop towers. That said, there’s still a place for both Windows and desktop PCs in this new order. So, can we all please stop saying the desktop PC is dying? Thanks! like i said before i just bought a PC in Feb. and i prefer them. as i said elsewhere, they have tablets for clients. they have i believe 3 of them. has norton (2004) on it! but it was i think donated and to be fair it's not connected to the internet they just use it for files. it's all done offline. i believe only 1 of them are like that. the other puters well PC's are online. and they are PC's. so they are still used per say there at least. my point is there are plenty of business that still use them. as for tablets my mom has one of those as well. really it's a kindle she has as well. i think? as for me? i just have a PC and that's enough for me! i have no desire to get a tablet or a laptop. or a kindle i'm old fashion i guess when i want to read a book i go to my bookshelf and pick a book out and read it. and actual book NOT one online. that's how i like it. to hold it in my hands and smell the pages of a new book.